First Crush’s full name is First Crush Winemaking Experience, and First Crush does in fact offer a variety of different experiences. 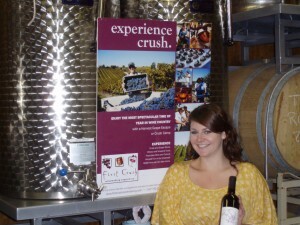 They provide programs for picking, crushing and eventually bottling your own wine, vineyard tours, blending seminars, all the way through complete winemaking education. There are lots of choices depending how deeply you want to delve into the various aspects of winegrowing and winemaking. I see this as a great opportunity for the wine lover who has always thought he/she might want to make wine some day to get a better idea of what it is all about. Or, just a great way to have a good time.